JEllen’s House of Fabric in Lyndhurst, Ohio, offers quilters a welcoming atmosphere and plenty of colorful inspiration. Coral- and green-tone fabrics and samples are arranged in a corner of JEllen’s House of Fabric. Another corner of the quilt shop houses batiks, quilting books, samples, and sewing notions. The notions area, formerly a kitchen, is dedicated to Kristen Kirton, a friend of owner Sarah Ely who lost her battle with leukemia a month before the shop opened. Derailed (on the wall) and Surfs Up, both by Crystal Stanworth, band together in nautical-theme display. Fabric collections by Me and My Sister Designs brighten the shop baby room. Pillowcases awaiting delivery to local hospitals in conjunction with the American Patchwork & Quilting One Million Pillowcase Challenge line the wall. Similar to colorful tiles set in a mosaic, squares set on point spin across this quilt top. 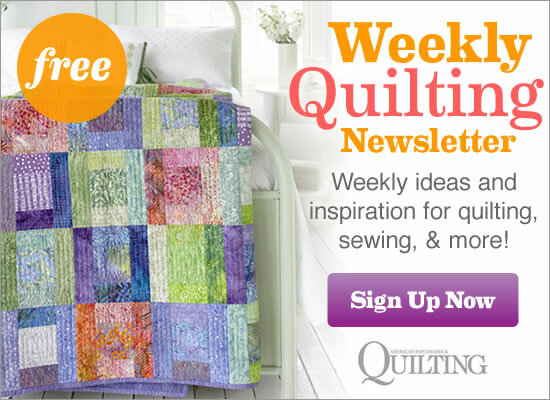 Crystal Stanworth designed Tile Twist for Quilt Sampler® Fall/Winter 2013 magazine. A large flower motif fills each diamond or triangle shape in Diane Wantz’s machine-quilting design. Contact JEllen’s House of Fabric to purchase a copy of Quilt Sampler® Fall/Winter 2013 magazine, pick up the issue at your local quilt shop or newsstand, or get the digital issue online. Peek inside Southwest Decoratives & Kokopelli Quilt Company, another quilt shop featured in the Fall/Winter 2013 issue.